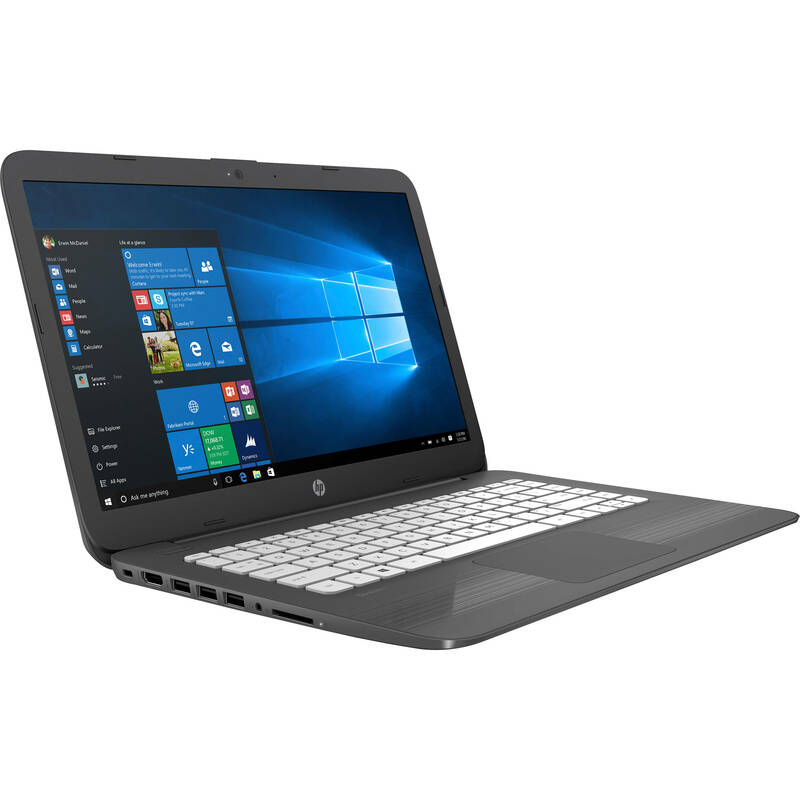 Thin at 0.7" and weighing 3.17 pounds, the 14" Stream Laptop 14-cb030nr from HP delivers productivity and lets you shift from doing homework to marathoning your favorite shows. The system is powered by a 1.6 GHz Intel Celeron N3060 Dual-Core processor, which allows you to run multiple applications simultaneously. If you need more power, the system can be overclocked to 2.48 GHz. The 4GB of 1600 MHz DDR3L RAM helps to ensure smooth multitasking and also allows the computer to quickly access frequently used files and programs. The memory slot is not accessible or upgradable. The 14" SVA BrightView display features an HD 1366 x 768 native resolution, WLED-backlighting, and a 16:9 aspect ratio. The integrated Intel HD Graphics 400 chipset delivers a sharp, clear picture, and you'll be able to output video to an external display at resolutions using the system's HDMI 1.4b output. For storage of your files, the 14-cb030nr is equipped with 32GB of eMMC storage. If you want to add external storage, optical drives, memory card readers, and more, there are two USB 3.1 Gen 1 Type-A ports and one USB 2.0 Type-A port. Wi-Fi 5 (802.11ac) is built-in wireless networking and Bluetooth 4.2 technology will also allow you to connect additional compatible wireless peripherals. A built-in multi-format digital media card reader lets users download content from their digital camera and other integrated features include a 720p TrueVision webcam, an integrated digital microphone, and DTS Studio Sound with stereo speakers. HP's 14" Stream Laptop 14-cb030nr includes a 45W AC adapter, and its 3-cell / 41Wh lithium-ion polymer battery kicks in when the system isn't plugged in and lasts for up to 9 hours before recharging is required. The installed operating system is Windows 10 Home, which comes with S Mode activated. Protection is provided by a limited 1-year hardware warranty with 90 days of limited technical support for software and setup from the date of purchase. Windows 10 S works exclusively with apps from the Microsoft Store within Windows. Certain default settings, features, and apps cannot be changed. Some accessories and apps compatible with Windows 10 may not work, including some anti-virus, PDF writers, driver utilities, and accessibility apps. Performance may vary, even if you switch to a Windows 10 Home configuration (fee may apply). Once you switch to Windows 10 Home, you can't switch back to Windows 10 S.
The Wi-Fi 5 (802.11ac) 2x2 Wi-Fi antenna delivers a stronger, more reliable network connection and with longer battery life, you'll enjoy enhanced streaming, fast downloads, and smooth web surfing all day. You'll have full access to Microsoft Excel, Word, PowerPoint, OneNote, Access, and 60 Skype minutes per month for one year, plus 1TB of OneDrive cloud storage for one year for improved productivity. Pair with a MU-MIMO router for a smoother online experience in multi-device homes. Pump up the volume to your favorite music, movie or game. Experience deep bass and clear dialogue for all your games, videos, and music. The TrueVision HD webcam delivers clear, smooth video chats so you can stay in touch with the whole family. An embedded multimedia card provides reliable flash-based storage. Integrated Intel HD Graphics 400 renders the on-screen visuals with a smooth, vivid quality. Enjoy your entertainment with the and high-definition detail and quality of 1 million pixels. Non-reflective and low gloss properties mean you'll get less glare while you're outside. Get a solid indoor visual experience with a bright, clear picture. Box Dimensions (LxWxH) 18.3 x 11.9 x 2.6"
Does it come with a CD slot?